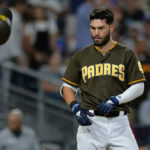 Breakdown: Naylor was acquired by the Padres alongside Carter Capps and Jarred Cosart, from the Marlins, for Andrew Cashner. Naylor was drafted by the Marlins 12th overall in 2015. 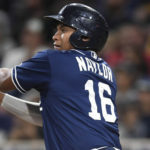 Naylor is currently the Padres #15 rated prospect, and he could easily hit 30+ home runs as an everyday bat in the lineup. Naylor is reportedly a below-average defensive first baseman, but his power could be a huge asset to the 2020 Padres’ bench. Alongside Naylor’s power, he has the ability to make hard contact to all parts of the field. He has great bat speed and consistently gets the barrel around the zone. Next in Line: Brad Zunica: If Naylor doesn’t pan out, Zunica is a similar player with great power potential. Zunica was a 15th round pick for the Padres in 2015. He is awhile away from the big leagues, but if he can continue to produce he could be a great power bat on the bench, if he can reduce his number of strikeouts. 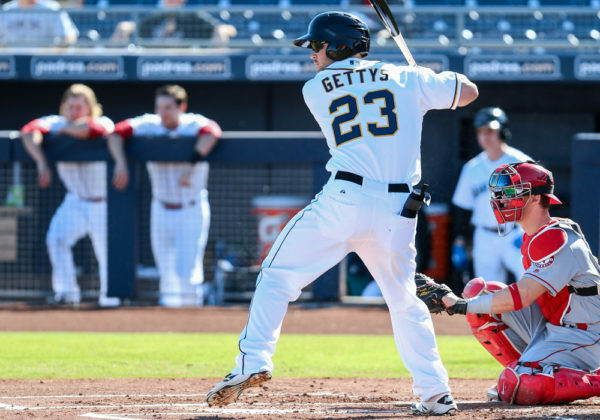 Breakdown: Gettys was drafted by the Padres in the 2nd round in 2014. Gettys has the ability to be a utility outfielder as he can play all three positions. Gettys, the Padres #13 ranked prospect, gets raves for his ability to be a potential 5-tool star. He has a great arm in the outfield, above average glove and speed, and some raw power. Gettys’ biggest problem is his strikeouts. 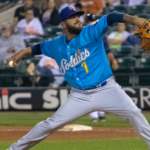 He led the Midwest League with 162 strikeouts last year for Fort Wayne Low A. Gettys has an incredibly high ceiling, and the Padres are hoping he can contain his struggles to reach his full potential. Gettys is a high-ceiling/low floor type of prospect. Next in line (Options): Franchy Cordero: If Gettys doesn’t pan out by 2020, Cordero makes for a solid back-up plan. 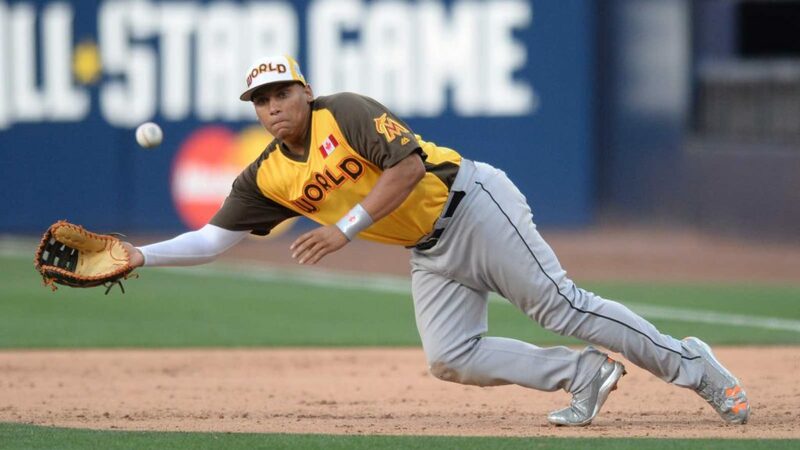 Cordero is the Padres #25 ranked prospect. He has been a fast riser in the system. He seems to be a high-floor prospect. Last year Cordero hit .290/.344/.450 with 11 home runs and 23 stolen bases across the three leagues he played in. Buddy Reed: The Padres’ #30 rated prospect was drafted in the 2nd round in the 2016 draft. Reed is a switch hitter who makes good contact at the plate. He has very limited power, but tremendous speed and defense. He could be a viable option as a fourth outfielder, used for defensive replacements and as a pinch runner. 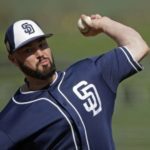 Breakdown: If Cordoba sticks with the Padres for the entire 2017 season, he will more than likely be sent down to Double-A or Triple-A at the end of the season. Cordoba never played a full season of professional baseball, but the Padres still took him 3rd overall in the Rule-5 draft. He is primarily a shortstop, but can play in the outfield too. I see him as a lock for the 2020 season on the bench if he sticks it out with the major league club this season. He has an advanced approach for hitting at the plate, and won consecutive batting titles in the Cardinals’ system. 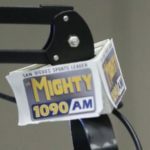 Next in line (options): Luis Almanzar: the 17-year-old was signed out of the Dominican Republic by the Padres as a part of their monster international signing period this past year. He was the #4 rated international prospect. He is only 17, and I don’t believe he will be in the majors until after the 2020 season, although he may develop fast, and be a solid option at backup shortstop for the Padres in 2020. He profiles to make good contact with some power, and has impressed scouts with his footwork and arm on the field. Breakdown: As I see it, Allen arrives in the big leagues at the very end of the 2018 campaign. He had a monster start to his 2016 season. Last year he finished with a .320 batting average and eight home runs over 420 at bats. Allen is more of an offensive-minded catcher as his defensive skills lack. He would be a great backup catcher to the defensive-minded Austin Hedges. I think they would balance each other out very well. Next in line (options): Luis Torrens: The Padres selected him 2nd overall in this past years Rule-5 draft in a trade with Cincinnati. I don’t see Torrens remaining with the Padres for the entire season, so I believe the Padres will ultimately lose Torrens or make a trade for his rights. There is a good chance he sticks with the club as he would make a great back-up catcher. He has a high-ceiling and has balance on offensive and defensive. 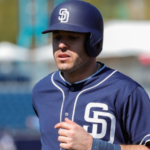 Breakdown: Asuaje was the odd man out after spring training this year. He hit .326 last year in Triple-A and showed great plate discipline. He would make a flexible defensive substitution option, as well as an effective pinch hitter in 2020. Next in line (options): Javier Guerra: Guerra had just as much hype as Manuel Margot when the two arrived from Boston for Craig Kimbrel. 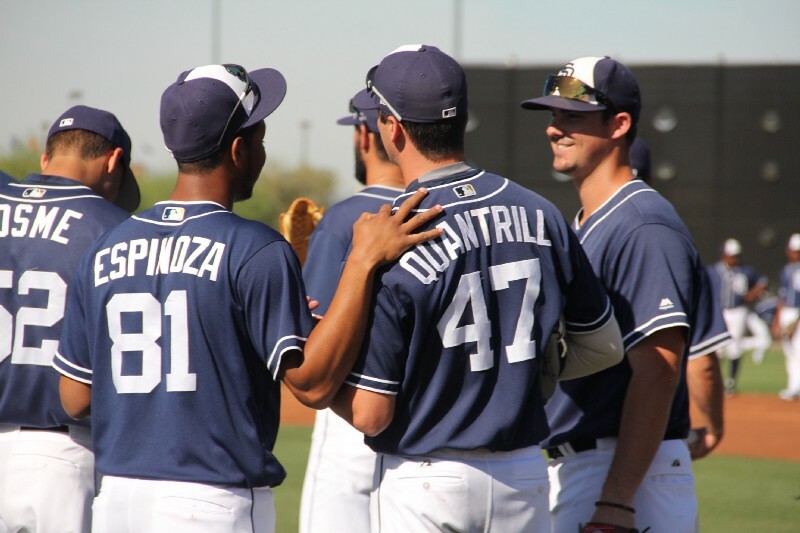 Guerra struggled mightily last year in the Padres’ farm system. At Lake Elsinore, he hit .202/.264/.325 and would strikeout at about 1/3 of time. He also had 30 errors at shortstop. Hopefully this year he can go back to the form he had when he hit 15 home runs and played stellar defense at shortstop. 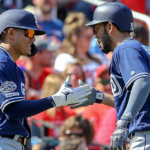 If Guerra can turn it around, he could potentially fight for the starting shortstop position for the 2020 Padres.